Simply One of a Kind: Great reunion! I had a lovely time at my old School Reunion at the weekend. It was a little difficult to recall some of the names of old pupils, but recognition mostly dawned for the majority of them, with a little reminder now and again! 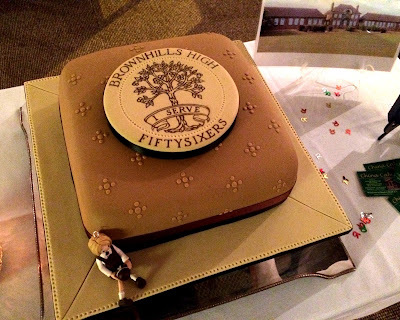 This year all the girls who started Brownhills High School for Girls in Tunstall in 1956 reached their 70th birthdays this year, so I guess we were entitled to forget a few names. 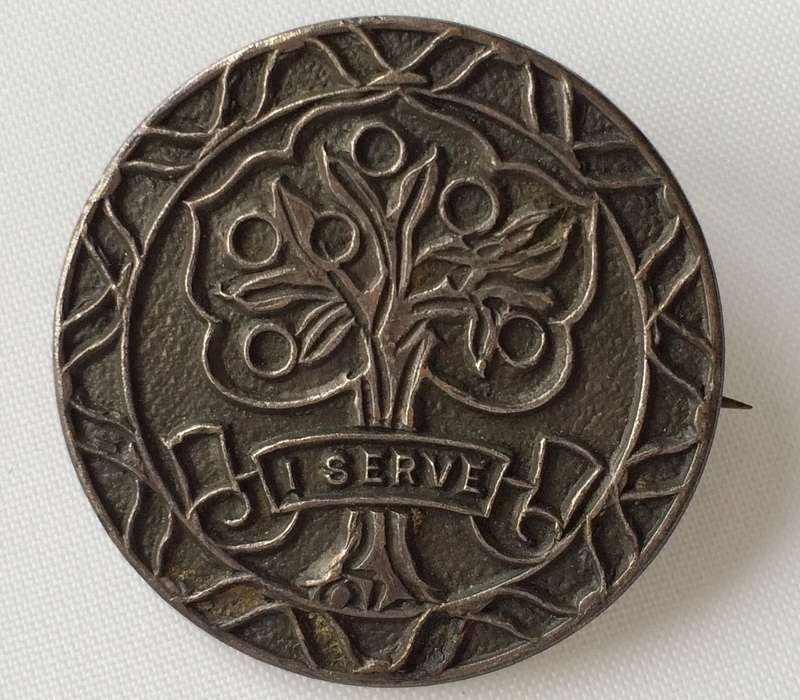 I found my old Prefect's badge in my jewellery box and decided to take it with me! I've always liked it; I don't know what metal it is made from but it looks rather like pewter. When we got to the hotel, one of our number had made a special 70th birthday cake for everyone and her daughter had decorated it brilliantly in our school colours! My school which is in the photo in the top corner has now been demolished! I simply took the colours for the stripes in the stockings. 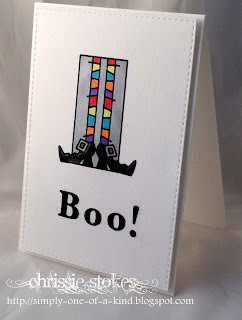 It's a Bugaboo image with a die cut sentiment and a little Glossy accents added to the shoes. It's also for AAA Cards Clean and Simple Halloween! 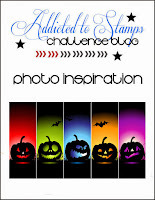 Love this fun Halloween card - super take on the photo. Thanks for playing along with ASM this week! So glad you had a good time at your reunion - that cake looks amazing! Awesome stockings! 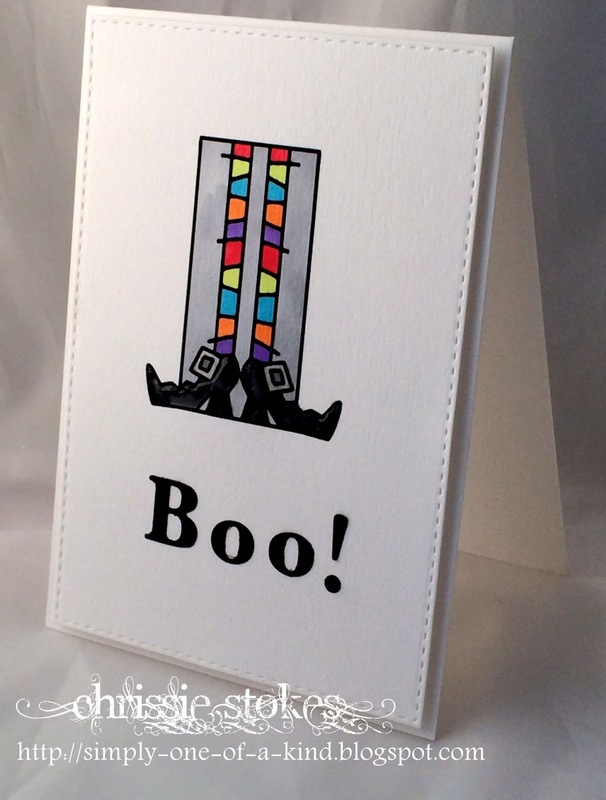 Fabulous card and perfectly CAS. Thanks for sharing at AAA Cards. Super cute CAS, thanks for joining us at AAA Cards! Fabulous cake and wonderful Halloween card, Chrissie!! !